With another record year of heating bills behind us, it’s time to start thinking about how to prevent them from recurring next year…yes, it could happen again. Repairing and replacing doors and windows not only can save you money, but also can be visually appealing, along with some other added changes to your home and garage you may have been wanting to do. Bob Davis of Window Outfitters explains doors, windows, and a fairly new product called Slide-Lok. Can you tell me why someone would want to replace their door in the first place if the one they have works fine? Just because your door works fine does not mean it should not be replaced. Energy efficiency is a big reason to replace entry doors today. Perhaps your old door is very drafty and not sealing well. 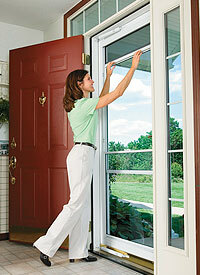 A new Energy Star steel or fiberglass door will save energy. Security is another reason to replace old doors. A new 20-gauge steel door, as an example, will be a far superior door from a security standpoint than most old doors. Why go with a fiberglass door instead of wood or another material? Fiberglass is an extremely energy-efficient door. It can be stained to look like wood, and it is not susceptible to the cold and heat, which can cause expansion and contraction in wood. Fiberglass also requires less upkeep than wood. What kind of designs can you get in a fiberglass door? Fibrglass doors come in many of the same designs that wood doors come in today. Some of the special shapes and sizes may not be available, but all of the most common ones are. We all know the benefit of insulating and replacing windows, but what about doing it with fiberglass? Fiberglass windows are an excellent alternative to vinyl or wood windows. Fiberglass is a stronger material, it is more energy-efficient, and most fiberglass windows carry a lifetime warranty including glass breakage. Unlike vinyl, fiberglass can be painted, and many of the fiberglass windows of today provide for a stainable interior, so that you can match your present wood interior trim. Are fiberglass windows more durable if, say, a baseball or some other yard object hits one of them? Fiberglass is a very durable product, but it is not impervious to damage. Baseballs, for example, may damage the window, but hail, unless it is softball size, will not. Fiberglass can withstand more heat than vinyl, and has a much higher ignition temperature than wood. You also sell Slide-Lok flooring. Can you tell me why someone would want to go with that over just a concrete floor? The Slide-Lok flooring product is applied over your present concrete floor. Before application, the floor surface is prepared by diamond-grinding off the top mil layer to open the pores. All cracks are patched, and then the product is applied. The product is a polyaspartic, not an epoxy, so it bonds to the concrete, making it a much more durable product over time. It will not flake or peel off like epoxies. The product carries a limited lifetime warranty. This is a product for individuals who spend a great deal of time in their garage, using it as a shop/work area or an additional room. With the Slide-Lok product applied, the floor is easy to clean, and provides a much more enjoyable operating environment. Slide-Lok cabinets look nice, but what other benefits do they have, versus something you buy at Home Depot or Target? The Slide-Lok cabinets are made of plywood with a pressure-applied veneer coating. The doors are warranted against warping, and the cabinets carry a limited lifetime warranty just like the flooring product. There are many finishes available, including a high-tech series and a NASCAR series.